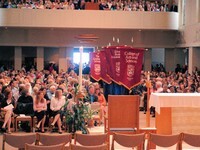 Students gathered in Madonna della Strada for the 2006 Baccalaureate Mass on May 18. The Loyola community holds Baccalaureate Mass at Madonna della Strada Chapel, January 1982. Loyola faculty and students lining up to enter Madonna della Strada Chapel for the annual Baccalaureate Mass, January 1982.